After 24 years of adventure, experiences that seem almost unreal and travels that have taken him all over the world, David Mohr laughs as he thinks back to where it all began – in the little prison town of Huntsville. The College of Criminal Justice will host the FBI special agent and SHSU alumnus on Tuesday (Oct. 26) when he will discuss some of those experiences for the college’s Real Talk with CJ lecture, at 2 p.m. in the Criminal Justice Center’s CJava Café. 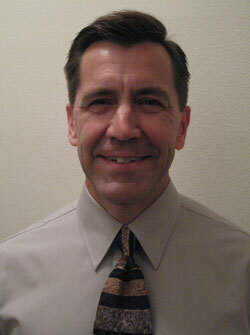 Mohr attended Sam Houston from 1979-1981, earning a Bachelor of Science degree in law enforcement and police science. Upon graduation he was commissioned as a second lieutenant in the U.S. Marines and served four years as an infantry platoon commander, attaining the rank of captain. In 1986, he entered the bureau, attended the FBI Academy and was assigned to the Atlanta field division. In 1992, he transferred to the Washington field office after being selected to the hostage rescue team, based in Quantico, Va.
Mohr said some of his greatest career highlights were while he was on HRT, a team known for its special agents who are trained to deploy in highly dangerous hostage situations nationally and internationally. Among his most prominent cases were the liberation of fellow Department of Justice employees during the Talledega Federal Prison takeover in 1991, participation in the tactical resolution of the Branch Davidian Standoff in Waco in 1993, and providing counterterrorism assistance during the 1996 Olympic Games in Atlanta, Ga. He also assisted with the hunt for fugitive and Olympic bomber Eric Rudolf in Andrews, N.C. and was part of the investigation of the Al-Qaeda terrorist attacks on Sept. 11. In addition, Mohr has provided force protection for investigators in support of the International Crime Tribunal of Yugoslavia in Pristina, Kosovo, and for investigators in Aden, Yemen, during the terror bombing of the USS Cole. In 2002, he was transferred to the Tyler resident agency, where he is currently employed and with which he participated in the search and recovery of the Space Shuttle Columbia astronauts in Lufkin in 2003. Mohr also served for three months overseas in the Middle East in 2005, providing counterterrorism investigative and tactical support while assigned to the 3rd Special Forces Group in Operation Enduring Freedom in Kandahar, Afghanistan. For more information, contact Beth Kuhles, College of Criminal Justice public relations officer, at exk005@shsu.edu or 936.294.4425. Dominic Walsh's "Terminus," a "very contemporary" ballet, will be one of three pieces Walsh's dance company performs when they come to campus Oct. 29-30. A group recently heralded by the Houston Press as the “Best Dance Company” will present three works in the Performing Arts Center Dance Theatre on Friday and Saturday (Oct. 29-30). The Dominic Walsh Dance Theatre, a contemporary ballet company, will perform at 8 p.m. each evening. The company will perform what dance program coordinator Jennifer Pontius calls “very contemporary” ballet. “It’s not going to be traditional pointe work and tutus,” she said. The pieces will include “Terminus” and “Medea,” choreographed by Walsh, who was a principal dancer with the Houston Ballet for more than a decade. “Medea” will feature live accompaniment by Two Star Symphony. Walsh’s “Medea,” is a new work commissioned by Teatro San Carlo that premiered in Italy in 2009. His collaborative “Terminus,” is named after the Roman god of boundaries and location and is inspired by Nicola Parente’s “The Edge of Urban Time” series. It features a video/painting installation created by the artist. The centerpiece of the program is an “intense excerpt” from “27’52”” by Ji?í Kylián, a world acclaimed choreographer based in The Netherlands, according to Leigh McBurnett, executive director of the Dominic Walsh Dance Theatre. “Kylián is considered to be amongst the most prominent and brilliant choreographers in the world today, and ‘27’52”’ is the most recent Kylián piece being performed in the U.S.,” McBurnett said. Walsh, a principal dancer with Houston Ballet for more than a decade, launched his dance company in 2002. He has received national and international praise for his interpretations of both classical and contemporary roles and has won numerous awards that have led to his being hailed as a leading choreographer. His contemporary ballet company “has built a stellar reputation for taking the techniques and skills of classical ballet into more inventive territory,” McBurnett said. While at SHSU, the company will be in residence teaching dance majors classes and the DWDT repertory throughout the week. The SHSU College of Education’s curriculum and instruction department will provide information to students who may want to add teacher certification to their degree plans during their “Become a Teacher Open House” on Tuesday (Oct. 26). The event, aimed at the recruitment of undergraduate students regarding elementary through secondary school certification, will be from 4-6 p.m. in Teacher Education Center Room 279. In addition, financial aid information for teacher education students will be provided at the open house with particular focus on the financial aid resources such as grants and loan forgiveness programs that allow students, upon graduation, to teach in identified schools and have portions of their student loans forgiven, according to Bobby Ezell, associate professor of education. “Potential loan forgiveness amounts vary from $5,000 to $25,500 per student depending upon the teaching field selected by a student,” he said. Teaching is a wonderful and fulfilling career and has become more challenging with technology and the global perspective experienced today, Ezell said. “Teaching today requires innovation, flexibility, and a new perspective of what schools should do and what teachers should be,” he said. “Yet with the changes in resources and with new demands upon the educator of today, teaching at its heart has to do with the relationship between the teacher and the student, and this relationship today as yesterday and tomorrow provides a way that the teacher can impact the life of a student and make the life more meaningful. “In this relationship between teacher and student, the teacher has the opportunity to work in a fulfilling job that, like no other, fulfills our human need to improve our world and make it better one student at a time,” he said. For more information on the open house, contact Ezell at 936.294.1123. Two SHSU College of Education faculty members and co-authors will share tips from their book “Writing a Successful Thesis or Dissertation” on Thursday (Oct. 28). The “multitasking brown bag event” will be from 1-3 p.m. in Lowman Student Center Room 307. Beverly Irby, associate dean for the College of Education’s graduate programs and Texas State University System Regents' Professor, and Fred Lunenburg, professor of education, will share their expertise in making the thesis and/or dissertation process more manageable. “Dr. Lunenburg and Dr. Irby have chaired many thesis and dissertation committees and, thus, directed many students in conceptualizing, conducting, and writing their research to complete the requirement for graduate degrees,” said Marsha Harman, director of the Professional and Academic Center for Excellence, which is co-sponsoring the event with the College of Education graduate programs. Both have also worked with faculty and masters/doctoral candidates from other universities and have conducted presentations or workshops on the topic of completing theses and dissertations successfully, according to Irby. The two will approach the topic in a step-by-step method of choosing a subject, conducting the research, writing the results, and defending the research to a committee. They will discuss both quantitative and qualitative research and will provide lots of examples including how to present and publish the research. “This workshop is simply to help graduate students find the process less terrifying and more systematic,” Harman said. All graduate students and members of their research committees are all invited. “Writing a Successful Thesis or Dissertation” has been a best seller for Corwin Press at research conferences where graduate students attend. Participants are encouraged to bring a lunch. Sam Houston State University’s department of theatre and dance will present “Dead Man’s Cell Phone,” written by Pulitzer Prize finalist Sarah Ruhl and directed by SHSU theatre associate chair Tom Prior, Wednesday through Saturday (Oct. 27-30). Show times are at 8 p.m. each evening, with a 2 p.m. matinee on Saturday, in the University Theatre Center’s Showcase Theatre. SHSU’s 2010-2011 participating entry in the Kennedy Center American College Theater Festival, “Dead Man’s Cell Phone” provides a discussion of how the dead are memorialized and the changes within a person as one remembers those who are gone. The dark comedy tells the story of a woman, Jean, who is forced to deal with her own ideas of morality, redemption, and the insatiable desire to connect to a world obsessed with technology after answering the incessantly ringing cell phone of a dead man. The cast includes musical theatre majors Adrianna Jones (Jean), Garrett Line (Dwight) and Molly Pierce (Other Woman), as well as theatre majors Heather Limmer (Hermia), Chaney Moore (Mrs. Gottleib), Bennett Schmidt (Gordon) and Latoya Curtis and Cameron Davis (both ensemble). Junior theatre major Michael Madro is the stage manager, and designers include junior theatre major Jeff Lindquist (set), senior theatre major Josh Fehrmann (sound) and theatre faculty members Eric Marsh (lights) and April Keith (costumes). Tickets are $10 for general admission. Group rates also are available. A footprint used to be what your kids left on the kitchen floor. Or maybe it was what police used to track a thief. Now, add the word “carbon” and your footprint figures into one of today’s biggest issues. For southeast Texans interested in finding out what the fuss is all about, Sam Houston State University’s family and consumer sciences department, Entergy Texas, Inc., and the Pew Center on Global Climate Change are joining forces to present “Make an Impact” a program designed to help determine a person’s carbon footprint and what can be done to minimize it. The program is set for 10 a.m. to 2 p.m. on Wednesday (Oct. 27) in the Lowman Student Center. Additionally, laptop computers will be available for participants to visit the Make an Impact website at http://entergy.com/makeanimpact, where in only minutes they can calculate their carbon footprint. Entergy’s Make an Impact initiative equips customers and employees with easy-to-use resources to understand energy use and ways to save energy and money while helping the environment. Attendees will receive environmentally friendly items such as water bottles and reusable bags, and one person will win a bicycle. For more information, call Paula Odom, customer service specialist for Entergy Texas, at 281.362.4084. Huntsville-area SHSU alumni and friends will have the opportunity to build the Bearkat network on Tuesday (Oct. 26) during SamWorks. The meet-and-greet event, hosted by the SHSU Alumni Association and the Huntsville-Walker County Chamber of Commerce, will be held from 5-7 p.m. at Margarita's Mexican Restaurant. “SamWorks is a fun Bearkat casual event to network with fellow Bearkats, SHSU administrators and business leaders,” said Donna Gilbert, SHSU Alumni Relations assistant director for membership and marketing. Appetizers will be served, and door prizes will be given away. Those who wish to attend are asked to RSVP by Monday (Oct. 25) at 800.283.7478 or http://alumni.shsu.edu. Tuba and euphonium players will pay homage to SHSU faculty members when they kick off three performances scheduled for “Octubafest” on Tuesday (Oct. 26). The faculty recital, featuring euphonium player Henry Howey and tuba player Robert Daniel, will begin at 7:30 p.m. in the Performing Arts Center Recital Hall. Howey and Daniel will be joined by SHSU's staff accompanist Mieun Lee and tuba player Stephen Adams in performing a number of selections including “a selection of beautiful folk songs by the famous English composer Ralph Vaughan Williams,” according to Daniel. On Sunday (Oct. 31), the SHSU Tuba-Euphonium Ensemble will celebrate Tubaween by performing special arrangements for the ensemble by Howey at 7:30 p.m. in the PAC Recital Hall. Finally on Nov. 3 students from the Euphonium and Tuba Studios will perform a variety of solos for both instruments, as well as in some small chamber groups at 6 p.m. and 8 p.m. in the PAC Recital Hall. Some solos will be accompanied by the piano. All Octubafest performances are free. Two music students will collaborate with a professor, while the SHSU Percussion Group will debut a song by a professor, during two concerts beginning Monday (Oct. 25). The collaborative piano concert—featuring assistant professor of piano Ilonka Rus, undergraduate pianist Rebeca Geabou and graduate pianist Andreea Mut—will begin at 7:30 p.m. in the PAC Recital Hall. The dance-themed performance will include pieces such as Astor Piazolla’s “Le Grand Tango,” William Bolcolm’s “The Serpent’s Kiss—Rag Fantasy” and Maurice Ravel’s “La Valse,” all for two pianos. “The ‘Paraphrase on Dizzy Gillespile’s Manteca, Op. 129’ by Russian composer and pianist Nikolai Kapustin will be played for the first time here in Huntsville,” Rus said. “It is a very cool jazzy piece. “We will also have the ‘Carnaval of the Animals’ by French composer Camille Saint-Saens, a very well-known composition which is written in a form of a musical joke: several animals such as the lion, the swan, the kangaroo, the turtle, the cuckoo are depicted musically,” she said. On Wednesday (Oct. 27), the SHSU Percussion Group will premier a new work by assistant professor of percussion John Lane about “where you find music,” that is, the Performing Arts Center. The presentation of “Music Where You Find It” will begin at 7:30 p.m. in the Performing Arts Center Concert Hall. Composers will include John Cage, Thierry DeMey, Russell Peck, Carl Schimmel, Michael Byron, and Lane, whose work was written in celebration of the new Performing Arts Center, Lane said. The Office of Multicultural and International Student Services will take on “trending topics” as part of the social media phenomenon during UniDiversity Week beginning Monday (Oct. 25). At noon that day in the Lowman Student Center Mall Area, the Office of MISS will ask students to “Follow Me @ SHSUDiversity,” which will highlight the diversity topics MISS programming is centered around. On Tuesday (Oct. 26), the office will address the “MISSconceptions” of “millenials” as it relates to social media at 11 a.m. in LSC Room 307. That evening, the Diversity Council will provide a “reality check” of what students as leaders do to lead in their daily lives and organizations versus what they would define as a leader. The event will begin at 5 p.m. in LSC Room 304. “This workshop will serve as a tool for students to see their shortcomings as leaders but also their triumphs,” Miller said. “First students will be asked to describe their perfect leader, then as a group we will discuss each aspect that is called out. After that each student will have to compare their leadership to our group list. “We will discuss ways to overcome shortcomings while encouraging them to continue doing the good things they do,” she said. Finally, on Wednesday (Oct. 27), MISS and the Program Council will allow students to take over the entire LSC with a day of games and other activities. The “LSC Takeover” will begin at 8 p.m.
For more information on any of the UniDiveristy Week events, contact Miller at 936.294.3588 or djm029@shsu.edu or visit www.shsu.edu/diversity. SHSU’s student organization, Plastic Bottles & Junk, will kick off Halloween weekend with a fun run on Friday (Oct. 29). that will benefit a local non-profit organization. The “Monster Dash” will begin at 5 p.m. at Old Main Pit and will also include contests, prizes, and other activities. Participants will run a one-mile course on campus while dressed in Halloween attire. The purpose of the event is to collect non-perishable items for the Good Shepherd Mission, so admission to the event is a minimum of two non-perishable food items, according to Brandi Cannon, PB&J president. Recyclables will also be accepted at the run. For more information, please Cannon at bcc013@shsu.edu or visit the “SHSU Monster Dash 2010” Facebook page. Your former piano teacher might not approve, but thousands have learned the secret of how to play piano with the chord method. On Nov. 6, Sam Houston State University will bring in Ed White to teach potential pianists just that when he presents the nationally renowned “How To Play Piano in Three Hours” workshop. The workshop will be from 1-4 p.m. in Music Building Room 219. For more than 22 years White’s workshop has brought seldom taught and highly sought after information to more than 100,000 people nationwide, according to Carolyn Gaines, coordinator of the Office of Continuing Education. “The materials are accessible and practical, and allow a person with little or no experience to start on the road to, and with practice, eventually achieve, professional playing skills,” White said. Students will learn how to use chords instead of traditional note-by-note music reading and how to use sheet music in an entirely different way, according to White. No prior piano experience is required. The course is $59, which includes a workbook and CD to take home and continue practicing. The $29 material fee will be taken during class. The registration deadline is Nov. 3. For more information, or to register, call the Office of Continuing Education at 936.294.4568. SHSU’s sport management program was one of six academic programs represented at the Sport and Entertainment Career Fair at Minute Maid Park on Oct. 1. 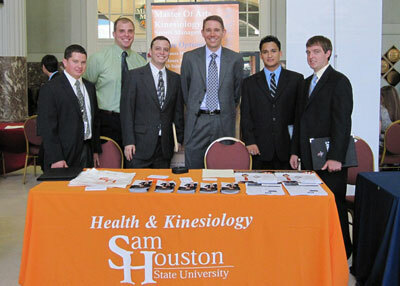 Twelve SHSU sport management students participated in the fair to network with professionals and learn more about the opportunities available with organizations such as the Houston Aeros, Houston Astros, Houston Dynamo, Houston Rockets, Houston Texans and Reliant Park, according to Ryan Zapalac, associate professor of sport management. "This was a tremendous opportunity that the Houston sports community provided our students," said Zapalac, who is also the sport management internship coordinator. "They were able to gain excellent insight into the industry and were also able to receive focused attention from representatives from each of the organizations. In addition, we were able to strengthen our ties with these organizations in order to increase future professional development opportunities for students." The event was hosted by the Houston Astros and sought to bring together representatives from major sport organizations and academic programs in Houston and surrounding areas. SHSU was also represented at the fair through the work of Mickal Terry, Houston Astros ticket sales intern and sport management graduate student, who assisted with the event, as well as the SHSU Athletic Department, which was the lone university athletic department attending. David Paitson, associate athletic director for external operations, attended to interact with local organizations and speak to individuals who may be interested in working with SHSU athletics. At the conclusion of the activities, students had the opportunity to meet with Glenda Morrison and Larry Stokes, human resources directors for the Houston Texans and Houston Astros, respectively. Audience members were able to ask questions about the hiring process and gain insight into the qualities that organizations are looking for. “Overall, this was a wonderful collaborative effort and we can't thank the Houston Astros enough for hosting the fair,” Zapalac said. “We very much appreciate the continued effort they put into helping our students succeed in the industry."